Have you found an online vendor selling Santiago de Cuba 11-Year? Like a real cuban rum. Nice dark brown colour. Spices and sugar cane. Round complex taste. Seems much older than 11yo. This rum will knock you down! The wooden aroma and the cognac-like old taste will rock your senses to the moon amd back! With out doubt, one of the best rhum ambassadores from Cuba. A liquor that is an exhiliated from this modern trend that makes rhums tasting like brandys or cognacs. This is old school as it finest. If you can grab a bottle. Take care because there's a lot of copies coming out from the island. The handicap, there's no stock of it anymore. Now you have to go for the 12 YO. 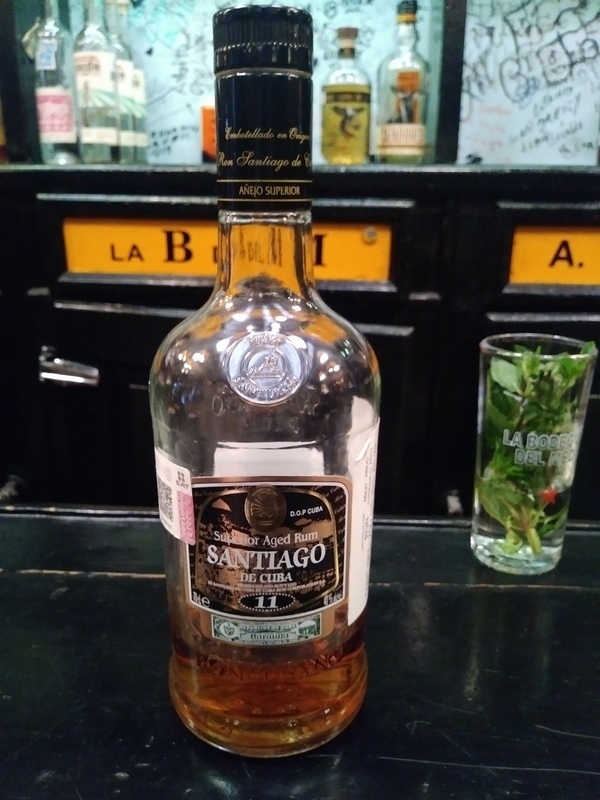 This is one of the Rums who I drink more, than it is not so Price like the other one from Santiago but the Quality and experience is (almost) the same. This is my favorite! A decent well aged Cuban rum, rich and spicy with great character. Nose is spicy and fruity, theres exotic fruit and a touch of sherry raisin. It's smooth and incredibly sippable. I am going to stay away from tasting 13 rums at an event it is unfair to truly rate any rum. Based on a highly ruined palate this most likely is not a fair score and will need to try again. It just felt too mild. Now I try to keep my tastings to 4 maximum if I really want to be fair to the ratings. Discover it thanks to our guide in Cuba. it is an amzing rum, the only downsize, it is almost impossible to find it outside cuba. Lovely color with so many complex flavors. I also had Plantation 20 and Plantation Stiggins (today) to compare it too. Noses well, but tastes amazing.Molasses, dark brown sugar(almost burnt).. Delicious! Would buy a case if I could!! Had this gifted to me in Cuba by a local. It is very enjoyable on ice. A true Cuban rum that I enjoy. Need to find where I can purchase more on my next trip to Cuba. Ron Santiago me dejo desilucionado. Pense que hiba a ser de mejor calidad. En mi opinion no esta a la altura de un Habana Club Ritual o de un Selección de Maestros. No esta malo, pero se le ciente un tufo a alcohol que me recuerda a los rones mas malitos de Cuba. Pero igual se deja tomar. Very smooth with a berry (to me) aftertaste. Easy to sip, easy to love. This rum is best enjoyed with a friend. Had this one recommended by my favourite bartender in Cuba..... mmmmmm! Se boit facilement assez doux dans la gorge il anime les papilles et le palet sans être agressif. This rum is best enjoyed with a friend and maybe a Cohiba. My buddy brought a bottle back from our trip to Cuba and I'm sure glad he did! Of course you never really drink it alone, Fidel entre nosotros. Purchased a bottle of Santiago de Cuba 11 yr Rum ($40 CUC) in May 2017. Bottle still intact and will update my review upon tasting. I have had this bottle of Santiago de Cuba Anejo 11 year Rum in my cabinet for over 6 months and time has come to sample it. I must admit that my expectations are high, a result of reviews read on RumRatings as well as other websites. The bottle, labelling and overall presentation of this rum was enough to convince me that this rum (which is not available in my area) is a must to bring back from Cuba and a bargain price of $40.00 CUC (approximately $60.00 CAD). 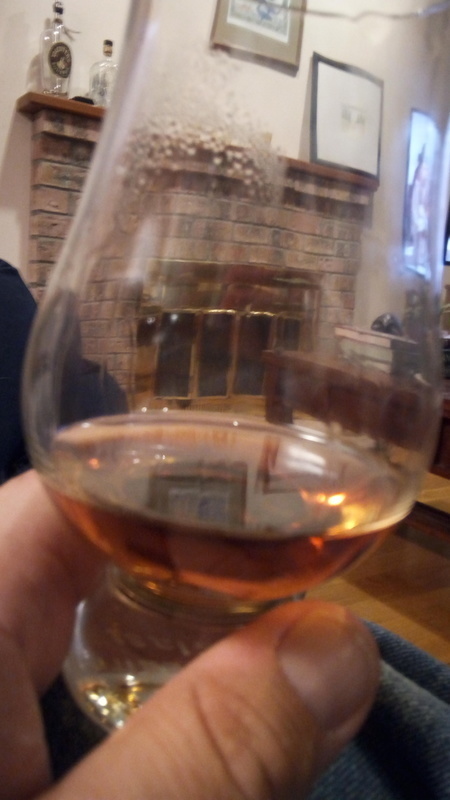 After pouring and swirling about 75 ml in my sample glass, I notice the copper colour of the rum, which looks inviting. My initial nosing observation is that of disappointment as faint smells of sugar cane and spices are barely noticeable and underwhelming. I let the rum breathe for 10 minutes and the flavours are finally coming through with notes of toffee, butterscotch and oak. The first sip was indeed enjoyable but the spiced taste was too prominent for my liking, overshadowing the flavours of toffee and caramel. This 40% ABV rum provides a light burn and the flavours remain on the tongue for several minutes. I am indeed disapointed by this Cuban rum as it taste more like a spiced rum, therefore I am assigning a rating of “6”. In my opinion the “Santiago de Cuba 12 year” rum is a much better and balanced rum. 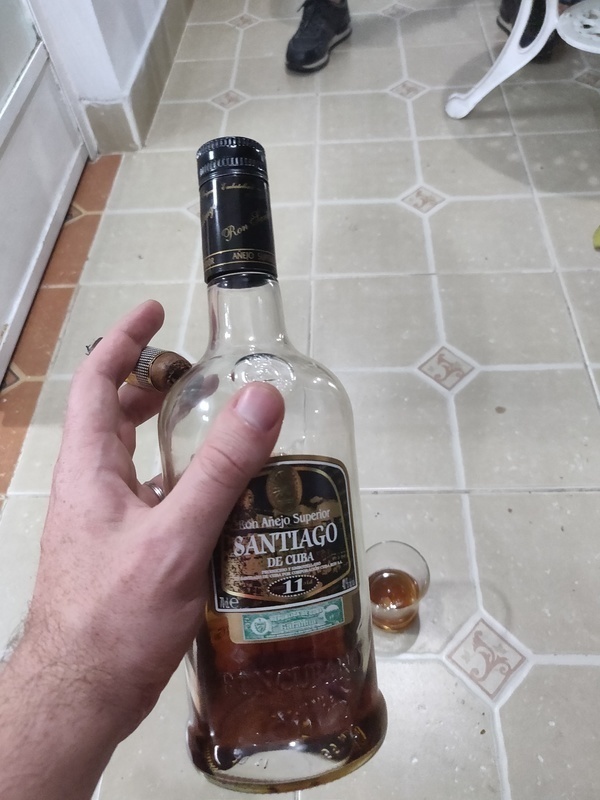 Tried the Santiago de Cuba 11 year old rum during my last trip to Havana and the most surprising fact with the smell and taste is that it's very close to the much more expensive 20 year old Santiago de Cuba. The 11 year old has traditional Cuban flavors and some burn at the end, and in a blind test you would not be able to make a difference between the 11 and the 12 year old rums. It is a very dry rum for sure. Sugar: Estimated at 10 GPL. A semi sweet rum with a nice aroma of honey or caramel with some toasted, not burnt wood. A smooth tasting rum with a the sweetness of honey, oak, and the spices in this rum makes this rum taste a bit like a sweetened Scotch. Pleasant burn and no harshness. Best Cuban rum that I have tasted so far. Good on it's own and very good with a single ice cube. This rum has a deep amber colour, and a pleasant sweet smell. It is a strong rum to sip, although not too alcohol tasting. The rum has a richness to it, although I can't say that it has a specific flavour profile of anything specific. It is a little sweet and makes a rum and coke with an unusual "depth" to it - You know you're drinking rum with this one. Being Cuban and visiting Santiago de Cuba has his privileges, I've tasted many Cuban and other country's Rum but I have never tasted a Rum so perfectly balance than this one. Is pure vanilla and burnt wood with a punch but it will last 3 seconds, NO alcohol after taste simply incredible highly recommended Rum. Deze rum scoort goed zowel bij de geoefende 'sipper' als bij de professionele 'mixer'. Deze 11-jarige Cubaan blijkt de 'talk of the town' te zijn tijdens het Fiesta del Habano in Havana dit jaar. Dit is ook niet zo verwonderlijk daar dit een heel toegankelijke rum is. Met zijn amber kleurtje en lichte tranen moet hij zeker niet onderdoen voor zijn oudere conculega's. In de neus ervaren we een lichte alcoholroes met zelfs een vegetale toets. Zeker niet onaangenaam en vooral niet agressief. Zouden de trillingen van de treinen de rijping op eikenhouten vaten dan toch die magische touch geven (lees bijgeloof in Cuba). Eens in de mond ervaar je alweer de zachtheid van deze Cubaan, die bij de eerste kennismaking toch wat karakter (ballen) mist. Dit merk je vooral bij de afdronk. Eens naar binnen weet je amper of je iets gedegusteerd hebt. Bij een tweede slok meng je de rum met wat speeksel en plots laat hij je kennismaken met zijn zachte caramel en vanille toetsen. Maar na het slikken is hij even snel weg als gekomen. Jammer, anders kwam hij aardig in de buurt van de 8. Zullen we hem dan maar als 'the genie in the botlle' dopen?